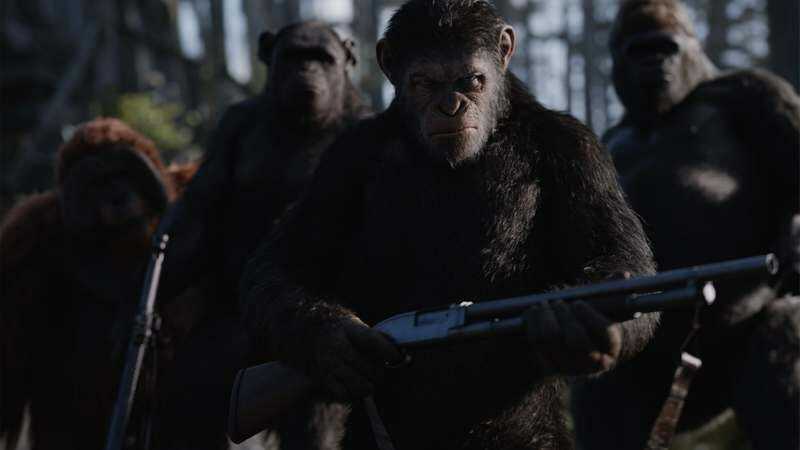 In a post-apocalyptic mid-June weekend, as big studio tentpoles fall slightly below projections, intelligent (but not that intelligent) apes rule the box office. Matt Reeves’ War For The Planet Of The Apes took the No. 1 spot this weekend with an estimated $56.5 million, almost $16 million less than its predecessor in the rebooted Apes series, Dawn Of The Planet Of The Apes. (This makes it the second Apocalypse Now-obsessed, Vietnam-referencing super-ape movie of the year to open below projections.) But look, $56.5 million is still a heck of a lot of money—more than enough to beat Spider-Man: Homecoming, which suffered the worst second-weekend crash in the Marvel Cinematic Universe to land at No. 2 with $45.2 million. Please note that this is still a lot of money, and that Homecoming has already made $469 million worldwide. Meanwhile, Edgar Wright’s very fun Baby Driver dropped in its third week to No. 4 with about $8.8 million, brining its domestic total up $73 million—perhaps a drop in the bucket by superhero movie standards, but more than enough to make it the most commercially successful movie of Wright’s career. (Hot Fuzz, for the record, topped out at $23.6 million.) Meanwhile, the Michael Showalter-directed Kumail Nanjiani vehicle The Big Sick climbed to No. 5 on its wide expansion, making $7.6 million on its fourth weekend in theaters. At least they can say they beat Wonder Woman (No. 6, $6.8 million), provided they don’t mention that the film has been out for almost two months and has grossed $764 million worldwide. Less successful was the opening of the poorly reviewed, relatively low-budget horror movie Wish Upon, which opened at No. 7 with $5.6 million, falling below expectations and more or less guaranteeing that it will come nowhere close to recouping its modest $14 million budget. Also landing in the Top 10 were Despicable Me 3 (No. 3, $18.9 million), Cars 3 (No. 8, $3.2 million), the surprise flop Transformers: The Last Knight (No. 9, $2.8 million), and, somehow, The House (No. 10, $1.8 million). On the very limited release front, where everything is measured in per-theater averages, the clear winners were Endless Poetry and Lady Macbeth; the former averaged an estimated $14,000 across two theaters, while the latter averaged $13,763 in five theaters.